There are Ichiran outlets all over Japan from Kumamoto in the south all the way to Gunma in the Tohoku region in northern Honshu making them one of the most prolific “ramen empires” in Japan, analogous to 松屋 Matsuya’s gyudon. Within Central Tokyo itself, there are outlets from Shinjuku to Ueno, so it is definitely not difficult to find an Ichiran outlet around. And this is what makes eating a bowl of ramen at an Ichiran outlet an unique experience. The “dining area” is usually rather cramped with the individual seating area compartmentalised. 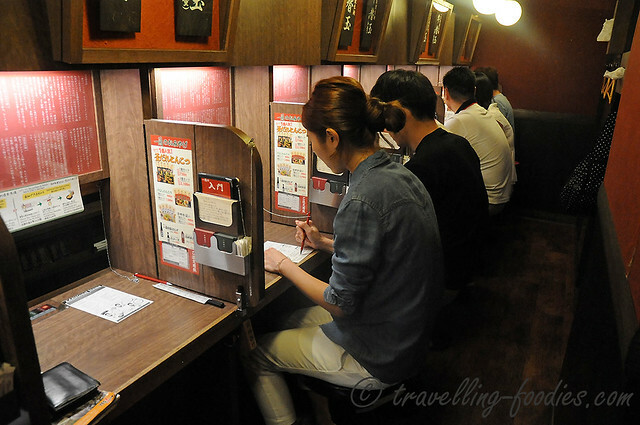 Instead of facing one another, the diners all face in a concerted direction towards the “kitchen” area where the ramen is being prepared. Between diners there is a partition which allows one to have one’s “own personal space” despite being seated so close together one’s shoulders may be touching the diner’s to the left or right. That said, the partition is movable which can be removed should the neighbours be acquainted to one another. Sounds like “open kitchen concept” where one could observe your bowl of ramen being cooked? Not so either! Apparently, one’s privacy even when eating a bowl of ramen is much valued, so there is actually a screen which prevents the diners from seeing the cooks and vice versa. In some outlets, there is a bamboo scroll-like blind that separates the two parties while in others, the opening between the two parties is so much narrowed that prevents one from looking at the other at eye level. 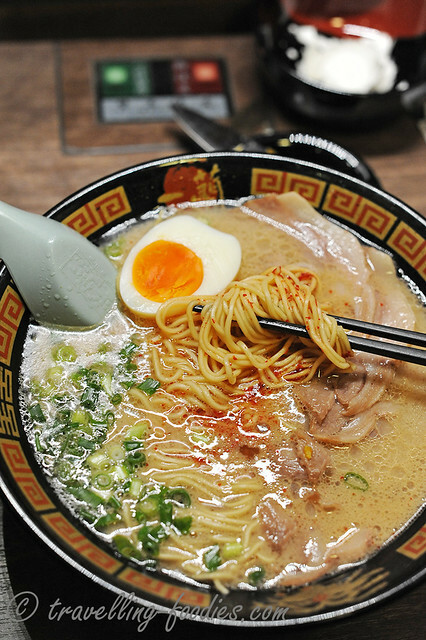 It is just sufficiently big for a bowl of ramen to be passed through comfortably without any obstruction and for the emptied bowl to be collected after. But don’t expect to be able to see face to face with the person to thank him or her for cooking your ramen. Loud slurping as an outwardish display of your gastronomic pleasure, as well as uttering an appreciative and sincere sounding “gochisosama deshita” when you are done would be more than sufficient, if you are up for it that is. There won’t be any staff to take your orders either. 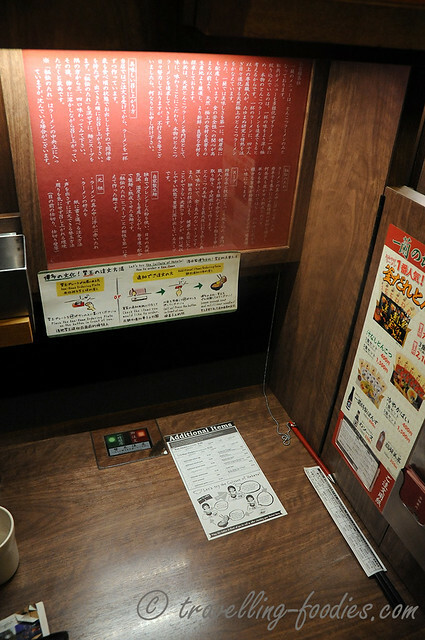 In many ramen tens and eating delis around Japan, the task of ordering food is simplified to a vending machine placed at the entrance of the shop. This liberates the staff from the responsibilities and tasks of taking orders and payment, allowing them to concentrate on their cooking. At Ichiran however, ordering a bowl of ramen is as simple as putting a few ticks on an order chit which is available in English as well. 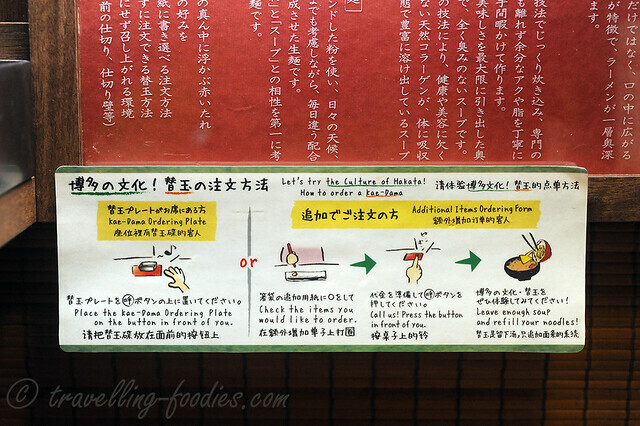 Not enough noodles, the procedure to order 替玉 “kaedama“， i.e. an additional portion of noodles is also pretty self-explanatory, but be sure to have enough warm broth in your bowl for the new batch of freshly cooked noodles to be soaked in briefly before eating. 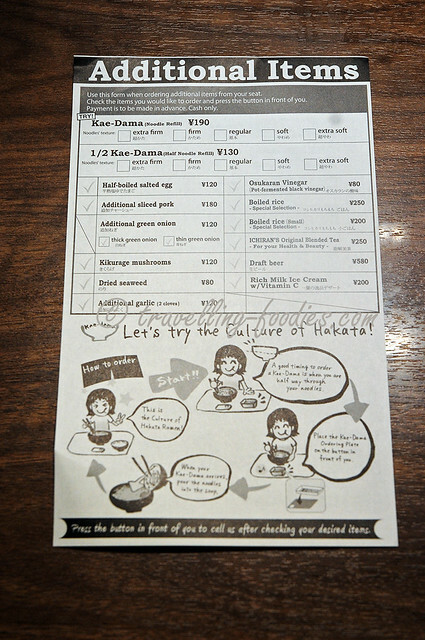 Kaedama can also be “pre-ordered” on the order chit itself, whole or half portion depending on one’s appetite, when one is very sure that one would be able to finish the additional noodle portion.As such I would recommend ordering a standard bowl of ramen first to ”sample” and determine if the noodles and the way they are being cooked is to one’s liking before deciding on the “kaedama”, which can be easily added on through pressing the bell on the table and follow the instructions on the panel which comes in Japanese, English and Mandarin. We generally prefer tonkotsu broth base compared to others like miso or shoyu based, so Hakata style ramen is definitely up our alley. 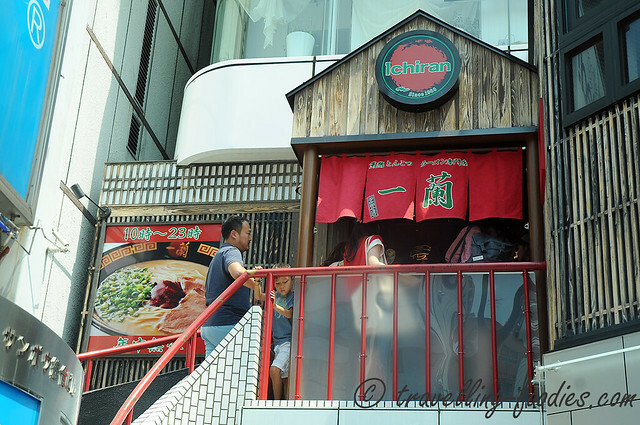 Compared to some other ramen joints which we have eaten before, Ichiran’s ramen are rather “decent and standard” on all accounts. 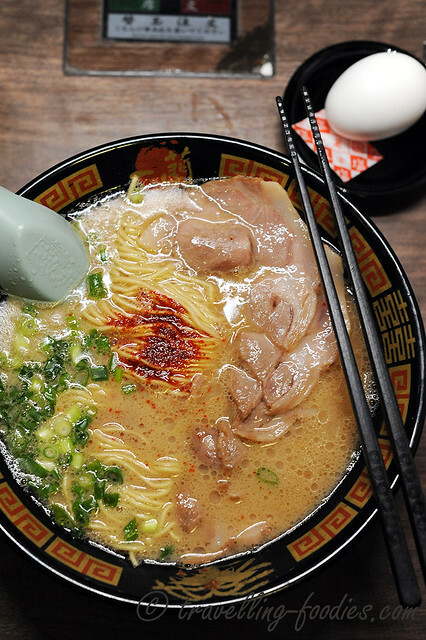 It has all the key things we look out for in a bowl of well-cooked ramen, i.e. smoothness and flavour profile of the broth, the texture of the noodles, the char siew etc. While I would say that it is gratifying, one shouldn’t overtly expect to be wildly surprised by how excellent it is. Don’t get us wrong, the quality of the ramen here at Ichiran is good and I would say above average, but just don’t think it to be really stellar or exceeding expectations. That said, if one hasn’t sampled tonkotsu ramen in Japan before, Ichiran would definitely be a good place to start. In summary we find Ichiran’s ramen rather well executed with little misses, though our allegiance still lies with 麺創房無敵家 Mutekiya for their to-die-for tonkotsu broth. But the queue that forms in front of the latter’s 本店 “honten” in Ikebukuro can be rather long as it is not just mmensely popular amongst tourists but the locals as well, so given Ichiran’s greater “accessibility” in terms of the sheer number of outlets around, it might well be the answer to one’s desire to have a good bowl of ramen without any fuss or hassle. For a comprehensive list of Ichiran’s outlets, please click to visit Ichiran’s English website. This entry was posted on December 6, 2016 by Alan (travellingfoodies). 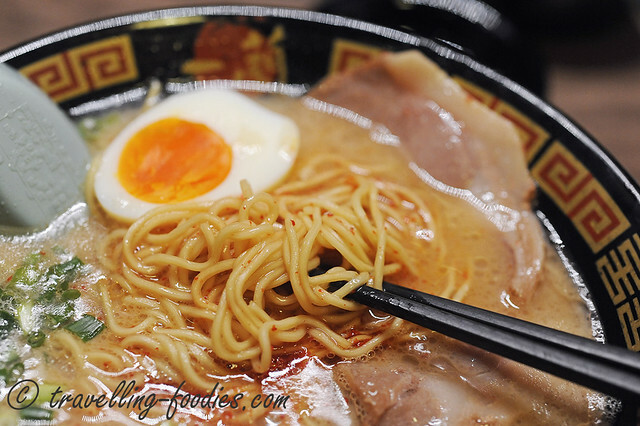 It was filed under General and was tagged with char siew, hakata ramen, ichiran ramen, ramen, tamago, Tokyo.